Do you suppose this doll is some sort of Sandra Lee/Giada hybrid? The platinum haired Barbie’s go-go boots totally match the faux KitchenAid and the skirt is super short, but the v-neck top is a little too conservative to truly be you-know-who. Either way it’s pretty cool. 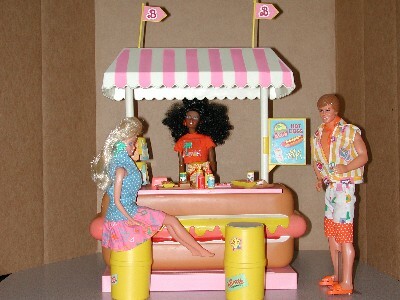 I had a Barbie Hot Dog Stand when I was little and I played with that set for years and years. I loved setting up the stand. After I lined up all of the little sodas, buns, dogs, and french fries I always made sure to overcharge Ken and Skipper. What was your favorite foodie toy? I had the same hotdog stand!! The food was huge compared to the barbies. I actually still have it! ha ha. I haven’t seen this new ‘celebrity’ chef barbie yet, what will they come up with next? I’m trying to interest my five year old in this but I haven’t yet. My Barbies would have gotten good use out of that TV camera, that’s for sure. I saw this too! I couldn’t tell if I loved it or was a little scared by it. Alas…. I wasn’t allowed to play with Barbie as a kid so this may be the reason for the deep seeded, totally irrational fear. Check out http://www.mygirlgourmet.com. I didn’t have this when I was a kid but I bought it for my daughter so I could play with it! That’s too much! *LOL* I was such a Barbie fan as a kid, I probably would have bought it. I was a huge Barbie girl when I was young. I think I had about 75 Barbies. Gross right?? I still have about 40 of them in a Rubbermaid storage container. I had the hot dog stand too. I don’t think I still have it though. That celebrity chef Barbie is pretty cool though. Except for the skirt and boots. It would have been cool to see her in a chefs coat. I still have my Barbie kitchen (and all of the fake food/utentils that come with it. OMG!!! I totally have to go out and buy this. I was just at Costco and didn’t see it. I atleast can say it is for my daughter, even though it really is for me. I love it! Good to see that barbie can cook and eat all of this and still maintain that figure – agh! At least they could’ve given her some chef pants and shoes. Who can cook in heels like that?! They seriously made Celebrity Chef Barbie?!! Oh man…you should totally go back there and get her, Erin! I can’t remember having any foodie toys, except maybe play doh? I know I had some kind of apparatus where you could squeeze the play doh through it and make “spaghetti”. i never had any foodie toys, there was no “hot dog stand my little pony,” and i played with jem instead of barbie because she was taller and had purple hair. this is so…blech. of course we can’t just have “successful restaurateur barbie,” we have to have porny food network barbie. BLAH. I had the Barbie Ice Cream Shoppe, which came with an actual ice cream maker that my mom and I used to make strawberry ice cream once. (My mom wasn’t much of a cook so I’m lucky i got to use it that one time.) It was cute…it had tiny cones and banana split plates that you could put little pink scoops of fake ice cream in. of course it was my easy bake oven!! I really, really think you should have bought it! Maybe it’s just me, but I like to indulge in all of my childish whims even at 29. My favorite foodie toy was my Strawberry Shortcake stove. I played with that thing until I was too old. And by that, I mean my parents had to secretly get rid of it when we moved when I was 12. I actually just Googled to see if a picture of it was out there and I found two. I can’t believe I found that many. Think I could substitute a GI Joe Emeril? You can tell a lot by what Barbie does. When I was a kid, I remember a McDonald’s Barbie being advertised. This certainly represents higher aspirations than fast food. And I’m surprised no one mentioned Sandra Lee. The blond hair and matchy-match outfit is a dead giveaway. i love barbies and im nine you can still be any age to play with barbies!